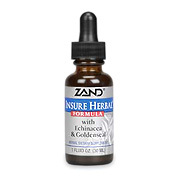 Americas #1 Echinacea and Goldenseal Formula that supports the immune system* during the cold, flu and allergy seasons. It features the renowned American botanicals Echinacea root and Goldenseal root in a base of Red Clover flower, Burdock root, Ginger root, and other supportive herbs. Take 1 - 2 droppers, three times daily between meals. Frequency may be increased to 1 dropper every two hours. Not to exceed 8 droppers in a 24 hour period. Do not use during pregnancy unless recommended by a health care professional. For use by adults and children over twelve years of age. Not for long term use. A 0.8 ml proprietary blend of an extract of Echinacea angustifolia root, Goldenseal root, Prairie Dock root, Red Clover herb, Sage leaf, Burdock root, Peppermint leaf, Parsley leaf, Fennel seed, Ginger root, Elecampane root, Bayberry bark, Chamomile flowers, Skullcap herb, Valerian root, Barberry bark, Blessed Thistle herb and Cayenne fruit. Insure Herbal is shipped in a discrete, unmarked package. Orders are processed immediately and usually take about 3 to 5 working days to be received. We do ask that you try it for 2 to 3 weeks to feel the full effects. Any information received is used only for order processing and shipping purposes. Your information, such as e-mail address, will never be disclosed to a third party.